New Delhi: Expressing concern over the alarming rise in pollution in Delhi-NCR, the National Human Rights Commission (NHRC) issued notices to the Centre and Governments of Punjab and Haryana where crop residue burning is generating smog that was traveling all over northern India. Besides, the Centre and these states, notice was also being sent to Delhi chief secretary. Taking suo motu cognisance of the matter, the Commission in its statement said that it has sought reports, within two weeks, from the different Union Ministries and State governments of Punjab and Haryana about the effective steps taken and proposed to be taken by them to tackle the situation. “Notices were issued to the Secretaries of Union Ministry of Environment, Forest and Climate Change, Ministry of Health & Family Welfare and Ministry of Highways & Road Transport along with the Chief Secretaries of the governments of Delhi, Punjab and Haryana,” the Rights group said. Taking a serious view of the situation, the Commission has observed that it is apparent that the concerned authorities have not taken proper steps throughout the year to tackle this hazard, which is amounting to violation of the Right to Life and Health of the residents in the region. 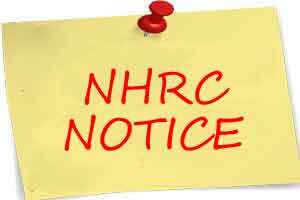 The NHRC said the Secretary of Ministry of Health & Family Welfare is expected to give details about the preparedness of the government hospitals and other agencies to attend to the people affected by pollution and steps taken to create awareness among the public at large. “There is an immediate need for effective action to be taken by the Union and the State agencies. Proper implementation of the environmental laws is necessary. The state cannot leave its citizens to die due to the toxic haze. There is a need for an effective study by the experts and proper implementation of their recommendations, including short term and long term measures identified. There is a need for preventive medical check-ups for the people,” the Commission stated. The Commission has also observed that the toxic smog in the atmosphere of the city has become an annual health hazard, particularly, at the time when the winters are about to start. Though, proposals of alternative roads to link the highways to avoid entry of the heavy vehicles inside the cities have been in the contemplation, no effective steps in this regard have yet been taken.